For those travellers wishing to experience great game viewing in a traditional and comfortable way. Arrive at Johannesburg International Airport, where, having cleared customs and immigration and collected your luggage, you will be met in the arrivals hall by our Falcon-Safari.com representative, who will be holding a board with your name on it. He will be your first contact, assist you with your luggage and check-in for your connecting flight with Air Botswana to Maun. Upon arrival at Maun airport you will be transferred by road to Grassland Bushman Lodge (this is a 4 hour trip). Grassland Bushman Lodge is situated on the western side of the Central Kalahari Game Reserve in the Ghanzi district, and is part of a private wildlife reserve of some 15 000 hectare. The family who run the Lodges have been in the area for 5 generations, and are proud to share their passion and knowledge of the area. Grassland is a small lodge, and accommodates only 16 guests, in comfortable en-suite (shower, basin, and toilet) chalets. Electricity is provided by generator. The main Lodge area consists of a large lounge and dining room, bar area, with adjacent swimming pool. This complex over looks a waterhole, and allows for some excellent game viewing. Activities at the Lodge are centre on a comprehensive San experience, day and night game drives, the predator rehabilitation centre, and horseback excursions. You get the chance to join the San families in their day to day life, from food gathering and cooking, to tracking game, and learning hunting techniques. Guests also visit the San Village, and you learn about life, in this remote, but beautiful area. Birding is excellent, with a number of predatory species such as bateleur and martial eagles, along with the stately secretary bird, and majestic ostrich. The Lodge is also proud of its Problem Predator project, which aims to assist in the re-introduction of endangered species such as wild dog and cheetah into the wild. After your last activity and breakfast you will be transferred back to Maun for your light aircraft flight to Oddballs Camp. From approximately May – December it is possible to camp overnight, in or on the outskirts of the Moremi Reserve (it always depends on the water levels which can be different each year). Guests spend their first and last nights in Oddballs. Camping in the bush is a unique way to experience the heart of the Delta, and something that you will remember for the rest of your life. Early morning and late afternoon game walks or mokoro trips are combined with relaxing in the shade of the trees, and the occasional swim. There are no facilities outside of Oddballs, and you will be thoroughly briefed upon arrival as to what to expect on trail. During the time spent away from the main camp you will become immersed in the African wilderness, the absence of other travellers and the abundance of new and intriguing sights and sounds will make the trip an unforgettable experience. In addition to the better known animals such as elephant, buffalo, antelope, lion and wild dog you will also have many chances to delve into the intricacies of the environment. You can learn about the construction of termite mounds, local uses for the indigenous flora and many tales of how the animals and birds came to be so weird and wonderful. You will have a Guide assigned to you for the length of your stay, one for every two people. The Guides have been living in the Delta all their lives and are eager to share their knowledge and enthusiasm with you. Use this opportunity to talk to your guide, and you will discover some amazing things about the Delta, the animal and birdlife, and the people that live here. All the camping and cooking equipment that you need, including a tent, mattresses & pillows, pots & pans, cooking utensils, cutlery, plates, bin bags, matches, kerosene lanterns, camping stools and a basic first aid kit are provided. Sleeping bag hire is an optional extra. All Meals are inclusive in my quotation, and are provided in the ‘Skull’ Bar and Restaurant. On Mokoro Trail, food is included on a self-prepare basis, and vegetarians are catered for – please advise in advance. It is up to you whether you wish to include your guide when planning and cooking your meals. He will not expect it, but cooking together is one of the things, which helps to create a good rapport. Walking will be an integral part of your stay at any time of year. You can decide how far you would like to walk, and your guide can help you to decide where to go. From approximately December – May the water can dry up considerably and for at least part of this period we may have to stop running mokoro trips. At this time we conduct early morning and late afternoon game walks, with up to six people per guide. The advantage of visiting at this time of year is that the animals are concentrated around the last remaining areas of water and are much easier to see. Accommodation in camp is provided in spacious dome tents set on raised wooden decks. The tents contain camping mattresses & pillows, and there are communal flush toilets and hot showers. We do not allow people to bring their own tents as this would increase your luggage allowance dramatically, and also our tents are already set up in the best spots! Camping is inclusive of all meals and equipment (except sleeping bags). All meals and activities from your day of arrival to your day of departure are included. Facilities at Oddball’s include a friendly bar which serves a wide range of soft drinks, beers, cider, wine and spirits. A stock of a limited range of chocolate and tobacco is also available. Sleeping bags can be hired if you do not have your own. A reasonably priced laundry service is also available. Feel welcome to browse through the reference library and book exchange. Oddballs also have an Environmental Trail, a self guided walk around the perimeter of the Camp with associated information on trees and plants and their local uses. The sun is strong and can catch you unawares, especially while you are on the water – take a hat and plenty of sunscreen! Mosquitoes are always around, although they are worse from November – April during the summer. Take suitable malaria prophylactics (consult your doctor), plenty of repellent and some light coloured long trousers and shirts for the evenings. You will need stout, comfortable shoes for walking, as well as neutral coloured clothing. Winter night temperatures can fall quite low and a jacket or fleece is essential, as well as a warm sleeping bag. A raincoat is also recommended from October – April. Bring a book and a relaxed attitude for those hot summer afternoons or cool winter evenings. Binoculars, a camera and a torch are recommended. It is sometimes possible to charge video camera batteries for you, depending on cloud conditions and office power usage, but you are advised to arrive with your batteries fully charged! All power is provided by solar panels. Please visit Oddballs Camp for mor info. On arrival at the Oddballs airstrip you will be met by your personal guide, who will be looking after you during your stay at Oddballs. At Oddballs you will be accommodated in a 2mx2m tent on a wooden deck. After lunch – (at Oddballs all your meals are included), you will go out with your guide for either a mokoro excursion or a walking safari. You will collect all your camping equipment and a hamper of food from the store (all included in your tour) and accompanied by your guide, you will go out on mokoro trail (subject to water levels). Your guide will find a suitable camping spot and assist you to set up camp, build a fire and prepare dinner. An early morning wake-up, and after some coffee, an early morning walk in the Moremi Game Reserve, returning after about three hours for a hearty breakfast. During the heat of the day you can relax, and then after lunch another excursion by mokoro and on foot. Dining by the light of the campfire under the canopy of the ‘African Sky’ completes your day. If you are particularly energetic, you can go out on a longer walking safari, taking a picnic breakfast or lunch with you. Walking safaris are truly one of the best ways to go out on safari, enabling you to be ‘at one’ with the environment, and obtain stunning views of both the wildlife and birdlife of the Okavango Delta. Your guide will be happy to track and stalk particular animals that you are interested in seeing. Another early morning safari, then return to Oddballs for lunch, and a rest before going out again for a mokoro excursion. You may also be interested in visiting the nearby village, where your guide will be proud to show you his home and introduce you to his family – a unique experience, especially if this is your first visit to Africa. After your four night stay at Oddballs, you will take a light aircraft flight to Xakanaxa in the heart of the Moremi. The scenic flight takes about 20 minutes. 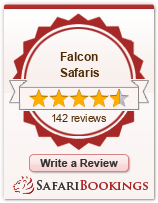 The focus is on game viewing in this beautiful area of open grassland and ancient Mopani forest, waterways and Falcons. Activities are game drives and boating. CATEGORY OF SAFARI EXPERIENCE: a traditional tented safari with your own guide, cook and camp staff to take care of you. A real ‘safari’ experience with camp established on a dedicated site. Another early morning game drive, brunch and then you will be transferred by light aircraft (20 minutes) to the Khwai area. Khwai is located on the eastern side of the Moremi Game Reserve. The focus here is on plains game and predators, in a beautiful area famous for cheetah. Activities are game drives. The Khwai Area at the North Gate entrance to the Moremi Game Reserve on the banks of the Khwai River is one of the best safari destinations in Botswana, with vast open floodplains bordered by mopane forests. The Khwai River, the easternmost branch of the Okavango Borders the Moremi Game Reserve and brings water to an otherwise arid area. This life-giving water attracts a spectacular array of animals – lion, leopard, wild dog and cheetah are frequently encountered whilst elephant are common throughout the area. After breakfast you will be transferred by light aircraft to the Savute area (a 30 minute scenic flight). The focus in this are is on game drives. The Savuti has over the years developed a reputation as a prime place to view predators in Botswana, especially lion and spotted hyena. The Savuti lies within the Chobe National Park and boasts one of the highest concentrations of wildlife on the African continent. The Savuti Channel itself was a river, but in 1982 it abruptly stopped flowing. The event was extensively covered by various wildlife documentaries. After the first summer rains have fallen, tens of thousands of zebra migrate to this area to feast on the sweet marsh grasses. After a morning activity and breakfast you will be transferred by light aircraft to Maun airport (a 55 minute scenic flight), in time to connect with your return Air Botswana flight, departing at 15h00 and arriving in Johannesburg at 16h40.